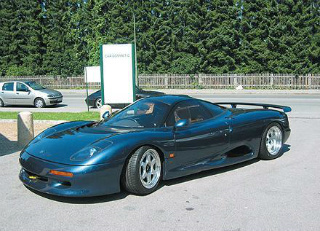 The XJR-15 sports car. In the late 1980's, a number of influential racing enthusiasts felt there was a need for a road-going equivalent to the successful XJR-9 Jaguar sports car racer. Consequently, in 1988, work began to convert this idea into a reality. As was the case with the XJ220, it was agreed that, in terms of the body styling, it should use as its template that of the iconic C-Type and D-Type. In terms of mechanical components, many of these would be sourced from those used in the XJR-9, which itself was powered by a 7 litre, V12 XK engine based on the 5.3 litre unit that was currently being used in the Jaguar XJS saloon. 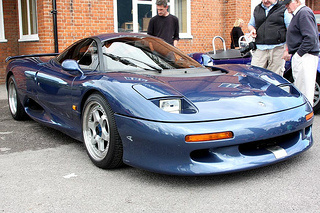 Designated the XJR-15, the new mid-engined car was to be powered by a 6 litre, 24 valve, V12 XK engine, linked to a six speed gearbox with no synchromesh, and electronic fuel injection. This developed 450 bhp at 6250 rpm, and 420 ft/lbs of torque at 4500 rpm, which produced a top speed of 191 mph, and a 0-60 mph time of 3.9 secs. About 20 of the cars were prepared with an alternative five speed gearbox with full synchromesh. The block, head, and Cosworth pistons were all aluminium, and there were seven main bearings. It had a compression ratio of 11.0:1, a drag coefficient of 0.30, and weight allocation of 48% front and 52% rear. Both chassis and bodywork consisted purely of carbon fibre and Kevlar composite materials, and as such made the XJR-15 Jaguar sports car the very first road-going car to be produced in this way. Built with such lightweight materials helped to keep the final weight down to a mere 1050 kg, which corresponded to the weight of many small family saloon cars. It used all round independent suspension, four wheel disc brakes with AP callipers, and the floor was kept flat. 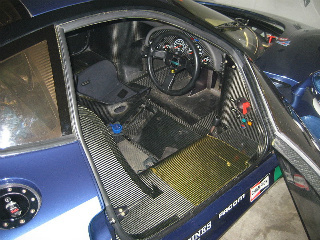 The XJR-9's internal space needed to be increased to accommodate the two seater design of the new car, so the cockpit was widened by 7.5 cm, whilst the roof height was increased by 4 cm. The first prototype was completed by mid 1990. The XJR-15 was presented to the world as a race car, even though it had been designed and developed as a road-going Jaguar sports racer. Furthermore, it was subsequently found that the ride height was greater than that which would produce the most optimum aerodynamic characteristics. Also, the alterations to the suspension produced a softer ride than had been experienced with the XJR-9. Jaguar cars released the new sports car to the press in late 1990, with its official introduction in early 1991 at the Silverstone circuit. Production commenced in 1990 and, by 1992, a total of 53 units had been built, and no more were planned. It was priced at $960,000, which included preparation and maintenance of the car by JaguarSport ( a joint-venture company). 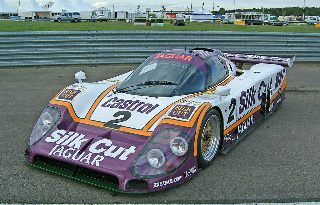 In 1991, a special racing Series was established, solely for the XJR-15 sports car, and was called the Jaguar International Challenge, with meetings held at Monaco, Silverstone, and Spa Francorchamps in Belgium. 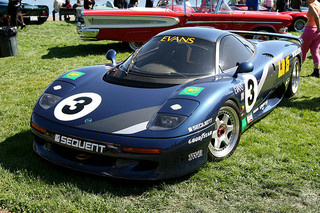 Individual events had a total of sixteen available grid slots for XJR-15's, with all three being fully subscribed. There was prize money of $1 million for the winner of the third and final race. All the cars were built with right hand drive, with the two seats positioned very close together, and towards the middle of the car. In order to get into the driver's seat, a wide sill had to be negotiated first, making entry not straightforward. Since there was virtually no form of sound insulation, the head-set provided was an essential fitment in the car. Also, there was only a particularly small area to act as storage. There was a small steering wheel, and the gear lever was only a couple of inches away on the right hand side. When changing gear, the travel distance between one gear and another was extremely small. The driving position provided an excellent forward view of the track. In all, the car was well received. When considering the selling price of these Jaguar cars, then an example in good condition could command around $130,000, whilst one in excellent condition could fetch as much as $200,000. Once again, with only 53 units of the XKR-15 built, there will always be a high demand for one of these Jaguar cars.